The first day of winter has brought with it our first noticeable snow of the season here, alas only a dusting. The temperatures are now in the mid twenties here as I write this. However, for most of the season so far, it has been very mild for this time of year. Thunderstorms with hail had taken the place of snow and ice. But this hasn't stopped the northern bird invasion. While recently looking for any odd grebes and loons that are different from the "regular" species seen at East Fork State Park beach, I spooked up a small bird from the beach. 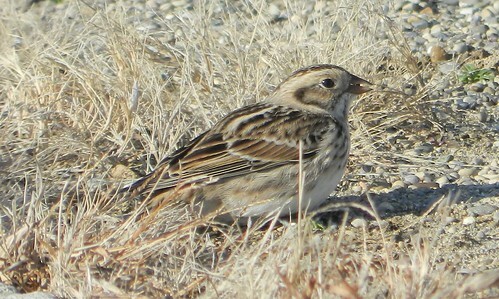 I recognized the call as a Lapland Longspur. This would be cool to see one, as I have only seen them a few times. The bird flew out over the open lake, only giving distant views. 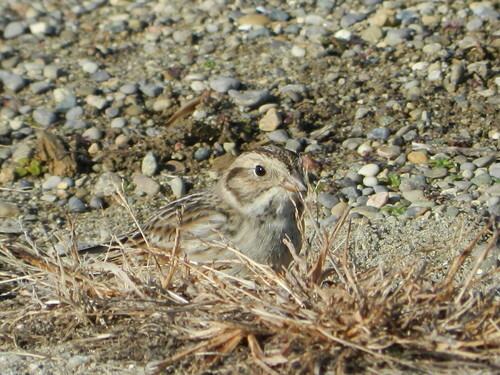 As I was walking back to my car to head for home, a small bird landed not far in front of me. It quickly disappeared among the grasses that border the beach. I carefully moved in the direction of the bird. I then spied some movement and this is what I found. 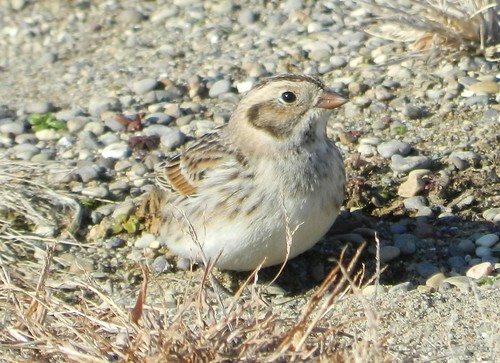 A Lapland Longspur! And only about 5 ft. in front of me. 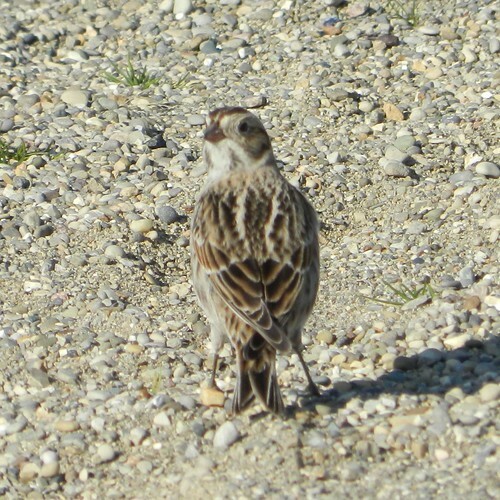 It seemed to calm down and started to feed on grass seeds along the edge of the beach. This is the closest I have ever seen one. I took time to watch and study the bird. Notice that the bill looks identical in shape as the Snow Bunting's. They both feed on grass seeds and are very similar in behavior. And just as fast as the bird appeared at my feet, the bird ran to the center of the sandy beach and looked at me one last time as to say "goodbye" and flew out over the lake. Since this is the preferred food of the crossbills, I decided to head west on my next nice off day. 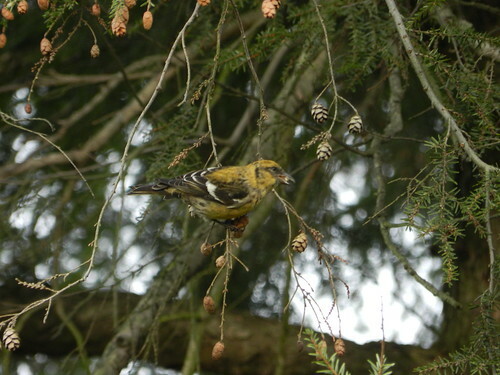 I have been told that the crossbills that are being seen at Spring Grove Cemetery are far up in the hemlocks and very active/flighty. However, this is the only place where both species have been seen. 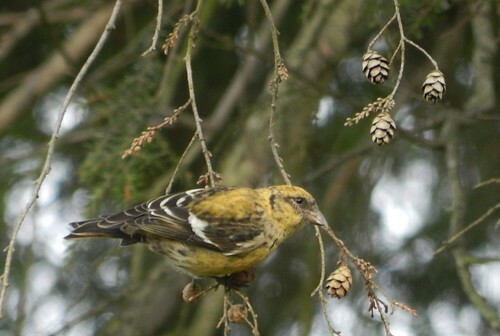 I have also seen reports from other birders that you could see White-winged Crossbills fairly close at the small county park named Mitchell Memorial Park. I just read a report that 7 WW crossbills were there earlier in the day, so I decided to go chase them. Upon arriving at Mitchell, I could hear several Red-breasted Nuthatches calling. 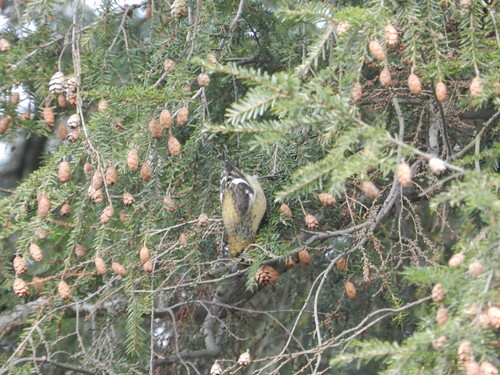 As soon I got out of the car, I could hear and then saw Pine Siskins. I said to my girlfriend who was with me, "I think we are in the right spot." I found some hemlocks, but no crossbills. Then another birder had pulled up in a car and recognized me and told me he had seen one female up on top the hill in a hemlock. So, I decided to head that way. Just like that, he showed me the bird. 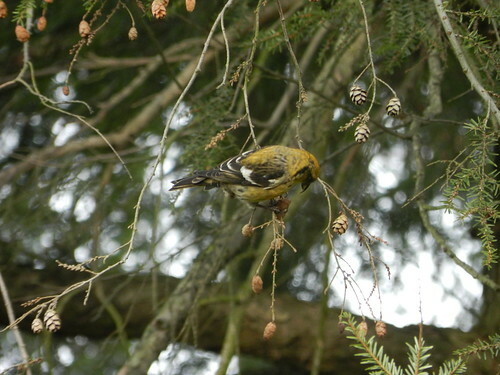 My lifer White-winged Crossbill! The bird was just chowing down on the hemlock cones. It was kind of funny watching it stretch to get the cones. Very cool bird! 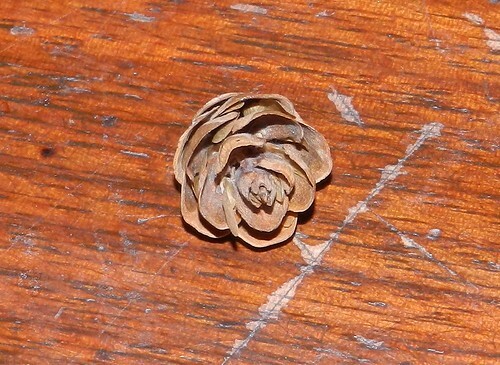 It is so adapted and specialized for feeding on cones. I am hoping to be able to go back out west and see some more and hopefully a male White-winged or even a Red Crossbill! I haven't seen one yet, but keeping my eyes open. Nice photos. 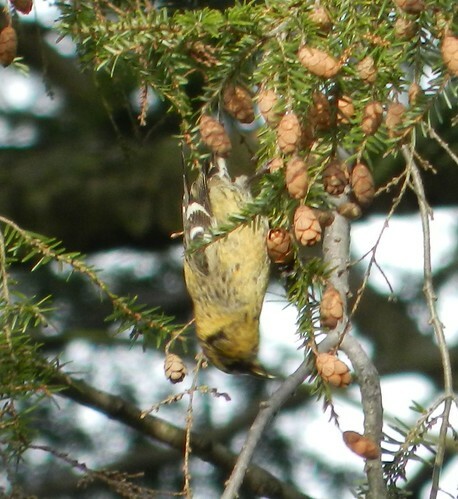 Congrats on the life White-winged Crossbill. 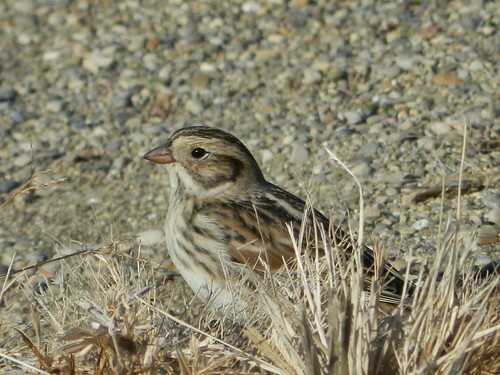 I've never seen a longspur of any kind. Great birding Donald! Congratulations on the lifer! 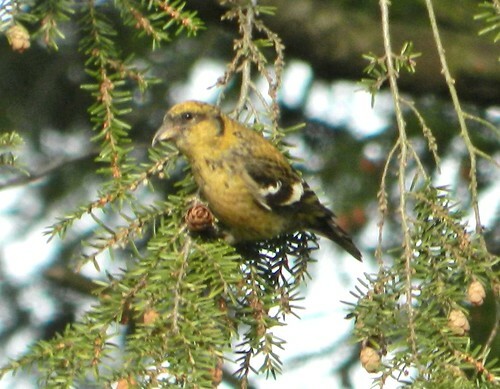 I've got my fingers crossed in hopes of seeing both crossbills this winter. 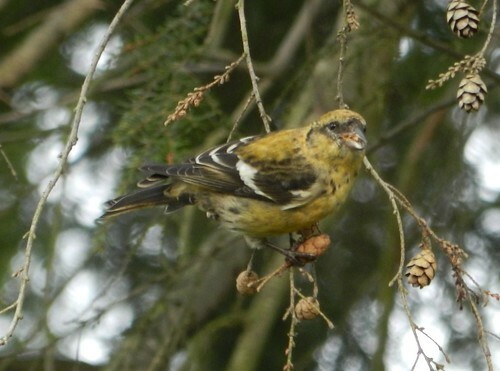 What a beautiful female White-winged Crossbill you spotted! Lovely longspur too.